**My Desert Cottage**: It's party time again!!!! To view the list of this years party guests... click here! 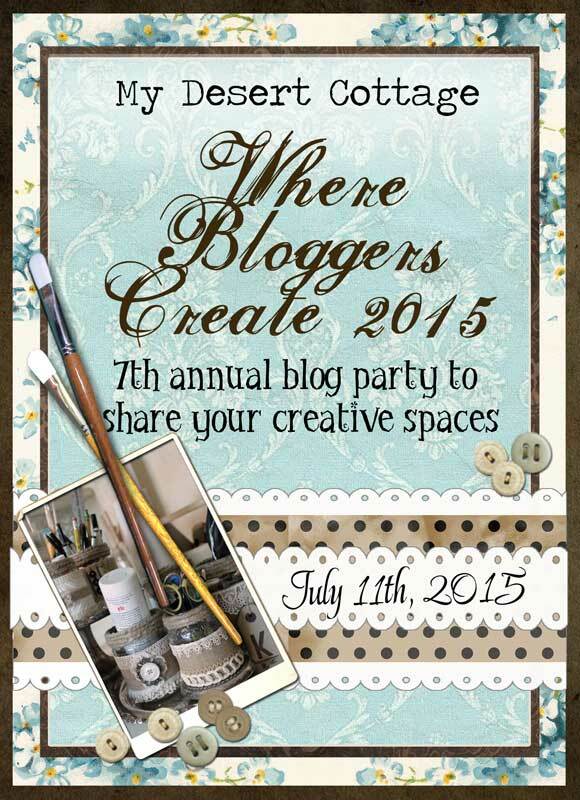 I can't believe I am kicking off year 7 of the Where Bloggers Create Party! I look forward to this event every year. You girls have some of the most inspiring and beautiful studios I've ever seen!! In the past years we've seen, beauty, ingenuity, amazing organization and some really cool ideas! The studios have been enormous professional studios and little sweet corners of your homes. They are all fun to look at so I hope you will join in on the fun whether you've never participated or you've played along since 2009! I tried something new last year and it really seemed to work well. It kept folks from signing up for the party and then forgetting to do their post, so we will do the Linky party again! With a link party, everyone does their post first and then comes over here to link up. You do not need to contact me to let me know you are going to be participating. (although I would love to know that you will be) Just come on over on the 11th and add your blog post to the list. 1. On or around July 11th do a new blog post that shows off your creative playground. Please do not fear that it is not good enough. There is always a wide variety of creative spaces to be found during the party and yours will be loved and appreciated by all of us. 4. If you plan to participate PLEASE grab the code under the button for the event and put it on your blog. (It's in the top right sidebar.) If you would do a short blog post to let your readers know you will be participating that would be wonderful. The more bloggers that know about the event, the more participants we will have and the more inspiration you will have! If you want to visit last years attendees, click here for last years party post and links to last years party goers. I hope to see lots and lots of you on the July 11th!!! Woo Hoo! : ) As always, I am looking forward to it! Thanks, Karen! I didn't join last year but have put your button on my sidebar to link this year Karen. There are always so many ideas shared. I'm looking forward to joining again, Karen. Congratulations on your photo shoot with Fifi O'Neil! That must have been super exciting. The dogs obviously loved it too :). Looking forward to participating again this year especially since I have made some changes in my Craft Room!! Thanks so much for hosting this terrific party which gives all of us so many wonderful ideas!! I've been wanting to do this for the past two years and haven't been able to. I'm determined to join this year! Thanks for organizing the Where Bloggers Create again. I'll be joining again and sharing my space and can't wait to see where others create too! Oh, I wondered about this year...I know how busy you are. Thank you for pushing me to clean up my studio and making it presentable. Even if it only lasts a week or two. I am in. well, i can see this link up is going strong...you're doing it yet again for seven years now. i don't know if i'll be linking up, but i will keep it in the back of my mind as i work away here in the studio. This will be my 3rd year visiting "Where Bloggers Create"... and hopefully it will be the year I join in the fun. I've been working very hard on both my creative spaces, my craft room and my sewing/yarn room. Neither is fully completed, but then they are creative spaces and I think they are forever evolving. I've already posted it on my blog and can't wait... looking forward to lots of great new ideas! Thanks Karen!!! I've said it before, I've said it again - this if my FAVORITE party of the year, Karen, and I'm THRILLED that you are hosting it once more! I'm sharing the news with my friends at Inspire Me Monday at Create With Joy this week - come party with us as we count down the days! I would love to participate to your "where blogger create" party, beacause I just have a new room only for me an to create nice things. Thank you for this opportunity with other bloggers. I'm looking forward to it! thank you so much for hostessing this ~ I always get so much inspiration from spaces small & large; fancy or simple. Yes, I am definitely in. I may be crazy because my son's wedding is July 18 and I am creating a lot of the decor, but this motivates me to get everything done so I can join the party again. You are wonderful for hosting! Yay! Is it that time? I love looking at others spaces... Looking forward to it. Yay! Thank you for hosting again! Can't wait! You are such an inspiration to all Karen! Not only did you design my Blog, but you are always there when I need you! I'm going to be on vacation, but somehow I'm going to join in the fun! Now, I can do a Craft Room tour video, even though it's a small space. I want to encourage those with minimal spaces, to be proud of the space you created! It's not how much space you have, but what you do with your space, that delights the soul! I'm revved up, and ready to go! I need more organizational idea's, and here's the place I'll get it! I've been working on my blog post for a week now. I keep adjusting and tweeking and simplifying. It's fun and I'm just going with what feels good. I saw Sandy Babb's post about the upcoming blog party so I did a post today for it, also. I used some of her words but I don't think she minds. Thanks so much for organizing and hosting. I'm enjoying myself. BTW, I have noticed recently that many bloggers are using the "kaptcha" (the thing that tells the system that I am not a robot). I think I disabled that on my blog posts but I can't remember if you wrote that in your suggestions. Just a thought. YOU ARE THE GREATEST!!! I'm so excited to actually participate this year, and you are such a sweetheart to put this great party together, Karen! This will be my first time, so I'm busy doing last-minute tweaks! See you Saturday! I've added the party announcement to my sidebar and will try to do a short post today or tomorrow. Thanks so much for hosting! I plan on doing this again--my fourth year, I think. I always enjoy this and look forward to being inspired by others. My room hasn't changed much, but perhaps a few people who didn't 'see it' last year, will take a peek into my creative space. I am so looking forward to this! Oh, and I've added the announcement to my sidebar. Now I just need to update! This is my first time participating and I am so excited. Can't wait to share and to take a peek at other bloggers creating spaces. See you there. Thank you Karen for hosting this party! It is my first time to participate..I am seeing a lot of beautiful studios and spaces while visiting the different blogs! I don't have any room in my house to make into my own studio, which is why I decided to claim my own corner of our backyard!